Looking for power but you need a system that’ll fit in your hand? If so, then look no further than the SIUI CTS-800 veterinary ultrasound. This palm-sized ultrasound scanner, ideally suited for reproduction exams for farm animals outside the vet office, features a 7-inch LCD monitor as well as vet software packages for equine, bovine, ovine, canine, feline, and primate. 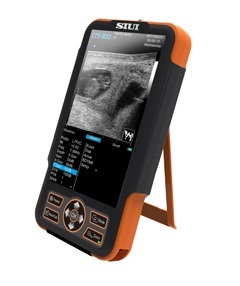 The SIUI CTS-800 veterinary scanner has a 4.5-hour battery life and it is waterproof, making it a durable ultrasound capable of meeting a variety of conditions of diverse outdoor settings. Another nice feature is this ultrasound’s gravity sensor, which rotates the image vertically or horizontally, depending on how you’re holding the ultrasound system. This is a very popular unit for livestock pregnancy detection. It’s lightweight, durable, waterproof and the battery can last up to 4.5 hours. Its portability and durability plus 2-year warranty as a new system are a great value for the price of this portable veterinary ultrasound machine. Weighs less than 2 lb.